Here is something that is always in the news, and probably is talked about around the water cooler more and more lately, and that is gas prices. With today’s high gasoline price, you may consider trying to find cheap gas. Well, this goes hand in hand with my previous article about car parts. Cheaper isn’t always better! The mom and pop gas station around the corner may have the lowest price per gallon, but you can be sacrificing quality of product. Just today, I had two customers that filled up at the same cheap gas station, and ended up having to bring their vehicles in because they weren’t running good and the check engine light was on. I knew there had to be a common denominator between both of them, and when I found out that they had just filled up at the same place, I figured it was a fuel problem. After checking the trouble codes, which happened to be for multiple misfires and running lean, I did a fuel sample on both vehicles. The first car I took a sample from was extremely bad. As you will notice in the pics below, it was more than a third a substance that was NOT gasoline. The second vehicle had nearly the same amount but wasn’t quite as bad. Along with the gas, which you can see is on the top of the mixture in the picture after it separated, there is another substance. It was hard to describe, but was oily, and very much thicker than the gas. It had settled on the bottom of the glass jar after it separated from the gasoline. The second picture shows the fluid after being stirred up a bit. It almost looked like a lava lamp when shook up good. 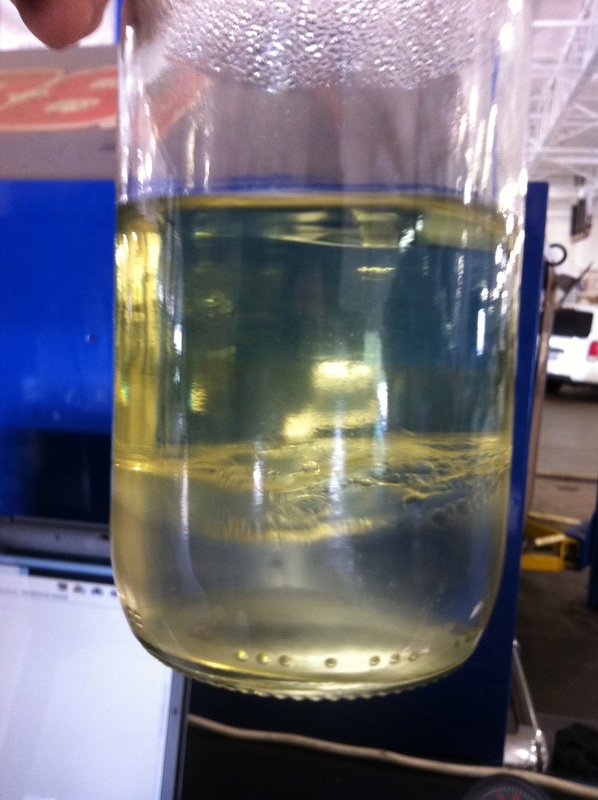 I’ve never had or seen such contaminated gasoline! The repairs required to fix this was to drain and clean out the gas tank, clean the fuel lines, do an injector cleaning/service, and fill with uncontaminated gas. This type of job is very labor intensive and very expensive! The price for saving a few bucks at the gas pump was not at all worth the expense in repairs to fix the problem it caused. Most car manufacturers have what is called a ‘top tier’ gasoline list. This form lists the approved gas stations that the manufacturer recommends purchasing gas from to keep your vehicle running at it’s optimum. Now, many of you out there have heard gas is gas, or it’s all made in the same place, but that is just isn’t the case. Most people don’t know that the real cheap gasoline you see at oddball stations and franchises, has sat in a storage facility for an extended amount of time. That alone is bad, because everyone knows that as gas sits or goes unused, it goes bad. Ever try leaving gas in your lawnmower over the winter? It probably didn’t start or even run well the next spring. The same goes for cars. Another fact about gas is that these lesser known providers don’t have the cleaners, additives and other ingredients that the high end stores add to their brand. That all helps with driveability, extended life, and an overall better running condition for your vehicle. Just like I said in my previous article about car parts, spend a little extra on quality gasoline and you’ll save in the long run. Guaranteed! 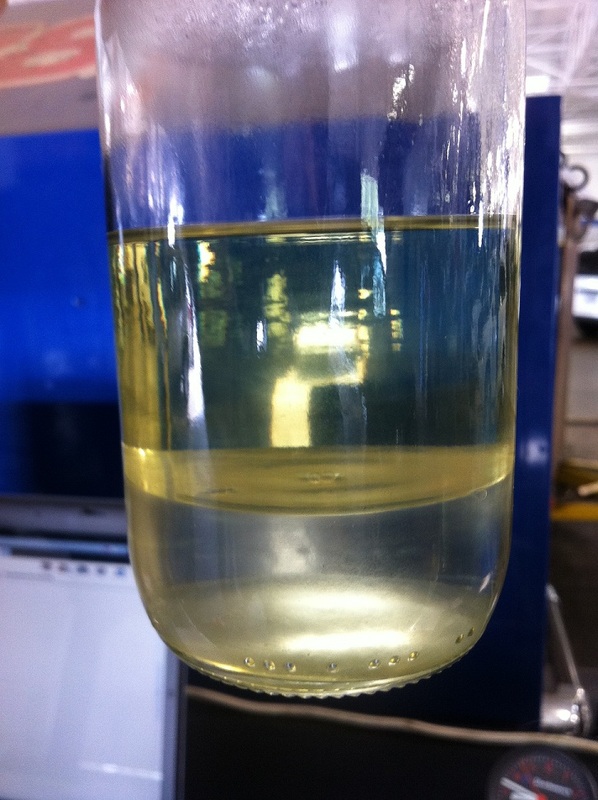 Below are pictures of the fuel samples with contaminated gasoline…Notice how it’s separated, the gas is on top and the ‘other’ fluid is on the bottom. This happens in the gas tank as well. This one is after I swirled the mixture around a bit….you can see the oily, bubbly fluid below the gas. My truck is using more fuel than usual. Gas mileage can depend on many factors. Cleanliness of the air filter, quality of the gasoline, running condition of the engine, etc… If you’ve just noticed it happening, try switching gas stations for starters. Even changing the oil can benefit gas mileage. I thought maybe a tune up was in order , i will check air filter , the last 2 tanks of fuel didn’t go as far. A tune up could help as well. That’s a significant difference, I’d try running a top tier gasoline for starters to see if it improves. Have the system scanned for codes, and check the fuel pressure regulator (FPR) for leaking gas. You’re welcome, glad to help! 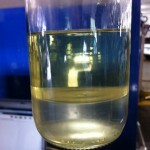 5 Comments on "Cheap Gasoline Quality and High Prices"
Does it protect as good as regular motor oil?. Thanks for that very infomative article Danny. A lot of GREAT information ! Hope to hear more from you ! Why are fossil fuels found in certain areas of the world in large quantities and not in others? Like, South Africa, Saudi Arabia and the Ocean etc. Had the same thing happen to my Ford F-150. Got some bad gas and the truck started running real rough, shifting funny, check engine light on and the rest. Towed it to the Ford Dealer and after a few hours of diagnosis, the mechanic took a fuel sample and found it had a lot of water in it. Thats what I get for buying cheap gas and trying to get more mileage for the money. Greats Pics, thanks. Do I Need New Brakes On My Car?